His elegant finish position is one of golf’s most photogenic poses. 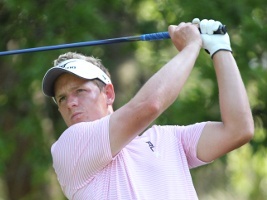 Likewise, Luke Donald’s grip makes a frame-worthy start to the Englishman’s classic move. It’s no surprise that Donald’s grip reflects timeless fundamentals. 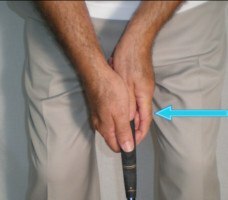 His right hand is perfectly positioned on top of the handle, with the forefinger in “trigger” mode and the thumb securing the club without locking it in a death grip. Donald’s left hand mirrors the position of his right, with the back of his glove pointed essentially at the target. One of many world-class players to employ an interlocking grip – others include Tiger Woods and Rory McIlroy – Donald keeps his hands lightly on the club. 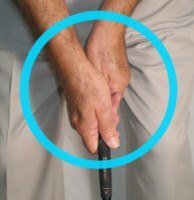 This is nearly as important as the hands’ position, because excess tension will wreck any swing before it starts. On a scale of 1-10, aim for a grip pressure around 4 or 5. Donald achieves another fundamental worth striving for. At impact, his hands return to a position nearly identical to where they began the swing. This is a consistent theme among pros and better amateurs. While scores of pros use unconventional putting styles, Luke Donald’s grip again reflects his traditional swing technique. 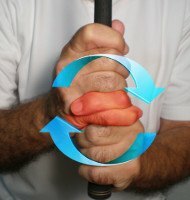 A standard reverse overlap with minimal hand pressure and palms in perfect harmony, the grip anchors a stroke that even his fellow tour winners envy. As well they should. Donald once went 449 consecutive holes without a single three-putt. That’s what a good grip can do.